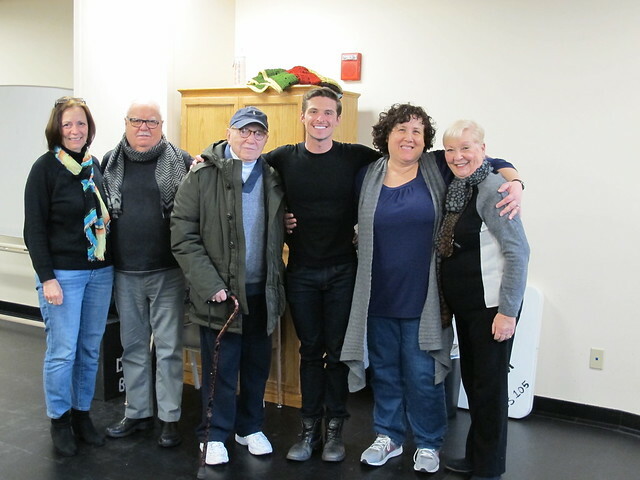 Alumnus Callan Bergmann (pictured center in a black shirt) returned to Point Park to host a Q&A with Conservatory of Performing Arts students on Jan. 22. Bergmann was in town performing in Pippin the Musical at the Benedum Center, located just a few blocks away from campus. Bergmann has performed in the Broadway production of Cinderella, off-Broadway productions of Silence! The Musical and Lucky Guy, and the TV series Smash. Hobbies and interests: Taking dance classes, cooking, hanging out with friends, sightseeing (when I'm on tour) and watching TV. Performing in plays and musicals was always one of my hobbies when I was in high school. During my senior year, I found out that I could actually go to college for musical theatre and so I set out to do just that. I took a map and drew a three-hour radius from my house in Gowanda, N.Y., because I didn't want to go to college too far from home. Once I realized Point Park had a musical theatre and dance program, I applied, auditioned and got in! I was so excited. I grew up doing gymnastics, but I knew I needed training in musical theatre and dance. I credit Point Park for shaping me as a triple threat (or a quadruple threat if you count my gymnastics skills). Growing up in a small town, Downtown Pittsburgh was a perfect fit for me because I needed a stepping stone before moving to New York City. Pittsburgh has so much to offer and it really is a great city. In what ways did the professors at Point Park help to shape you as an artist? Jack Allison, assistant professor of theatre, is one of my biggest influences at Point Park. He taught me how to understand a song, how to break it down and how to perform it. I still use the tools he gave me when I'm auditioning in New York or when I have to develop a character. I credit Jill Lazzini, an adjunct dance instructor, for encouraging me to push myself as a dancer, and Kiesha Lalama, associate professor of dance, for giving me an understanding of movement that you don't get at most schools. Kiesha prepared me for all of the genres of dance that you encounter in musical theatre. Be yourself, keep training and taking classes after college, learn how to network and have a good work ethic. Going to school at Point Park was the best four years of my life!